New Delhi: On January 5, Delhi University Teachers Organisation hel a massive protest in the national capital against the ruling government in centre for the changes in 200-point roster. The protest was joined by hundreds of teachers hailing from different colleges of Delhi University. Massive protest heated up when the protestors were stopped by the Delhi Police to march ahead resulting in beginning the arguments between the policemen and the protesters. Some of the female protestors also alleged that they were harassed by male policemen during the protest. Some of the prominent professors of Delhi University also joined the protest to demonstrate their aggression against the ruling party. The protesters were sloganing, “modi sarkar darti hai, police ko aage karti hai”, during their march from Mandi House, a truck loaded with sound system was used to speak out their issues. 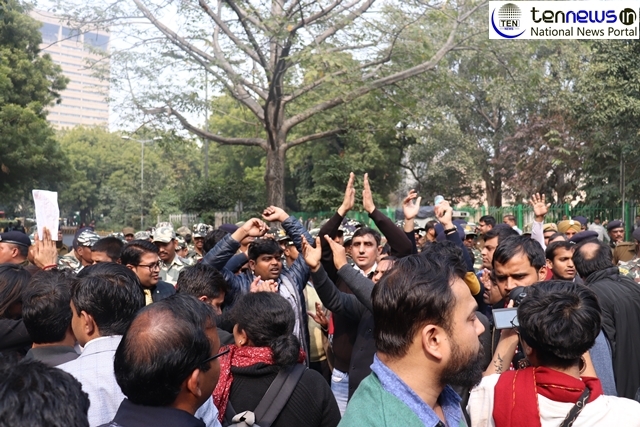 On January 31, thousand of protesters including teachers, students and activists went out on the streets of the National Capital to protest against the Bill/ Ordinance to restore the 200-point reservation roster on the basis of college/university as a unit instead of taking the department as a unit. The protesters also slammed the BJP-led NDA government.